In order to discharge a condition attached to the building control decision (018458) requiring a site investigation and a Coal Authority Report, Demeter Environmental were commissioned to undertake the works required to discharge condition 2. In order to determine if the site had the potential to be impacted by elevated levels of contamination / ground gases a desk study report was prepared prior to any intrusive works (in line with current good guidance). The review of the historical O.S. maps indicate the site was undeveloped until circa 1949, streetview images indicated the site was occupied by a residential garage. A number of excavations and a reservoir were identified to be present within 250m of the site. 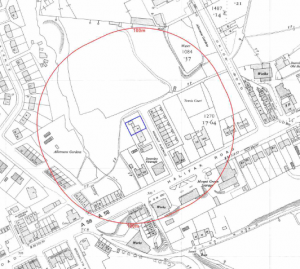 The environmental data identified a garage 50m south east of the site, which was regarded as being too distant to be a credible source of contamination. 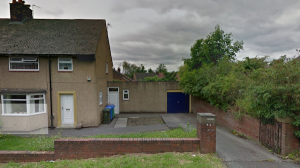 The walkover survey identified made ground on the site, as based on the description of the made ground identified it was concluded that removal of the made ground was a viable alternative to site investigation. The off site sources of ground gases could not be visited as part of the walkover survey due to assesses issues, but based on the information from the O.S maps and Environment Agency the risks from ground gases was sufficiently low as to allow the incorporation of gas protection measures as a viable alternative to ground gas monitoring to be proposed. The proposals of the desk study report were accepted by building control and the building works were allowed to commence.